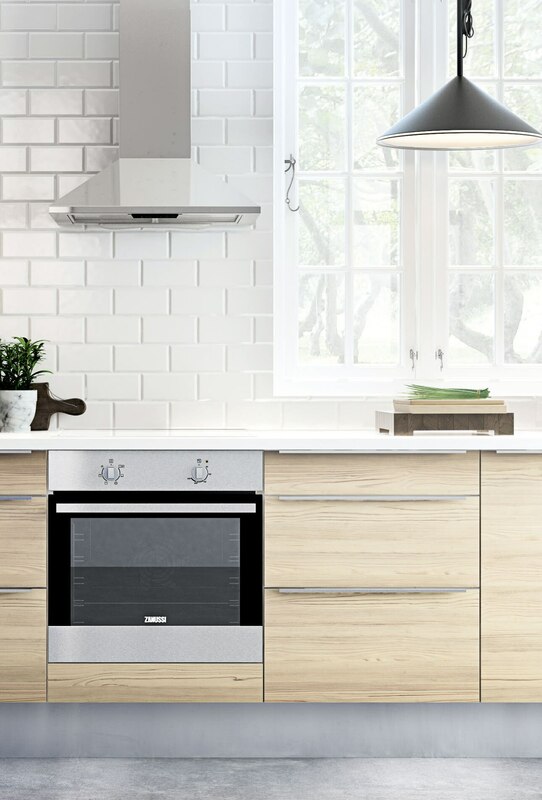 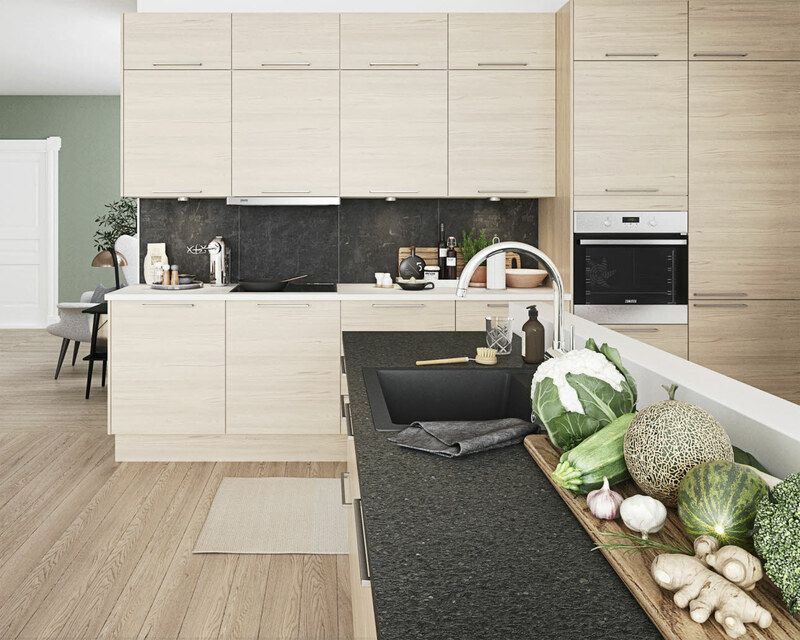 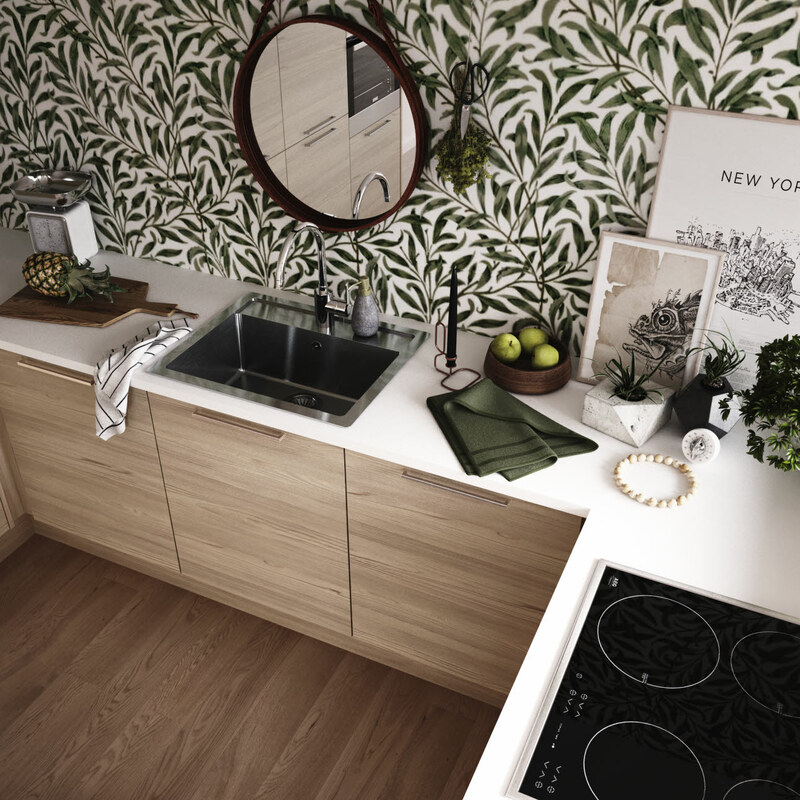 With model Oslo, you get a Scandinavian kitchen that looks and feels like wood. 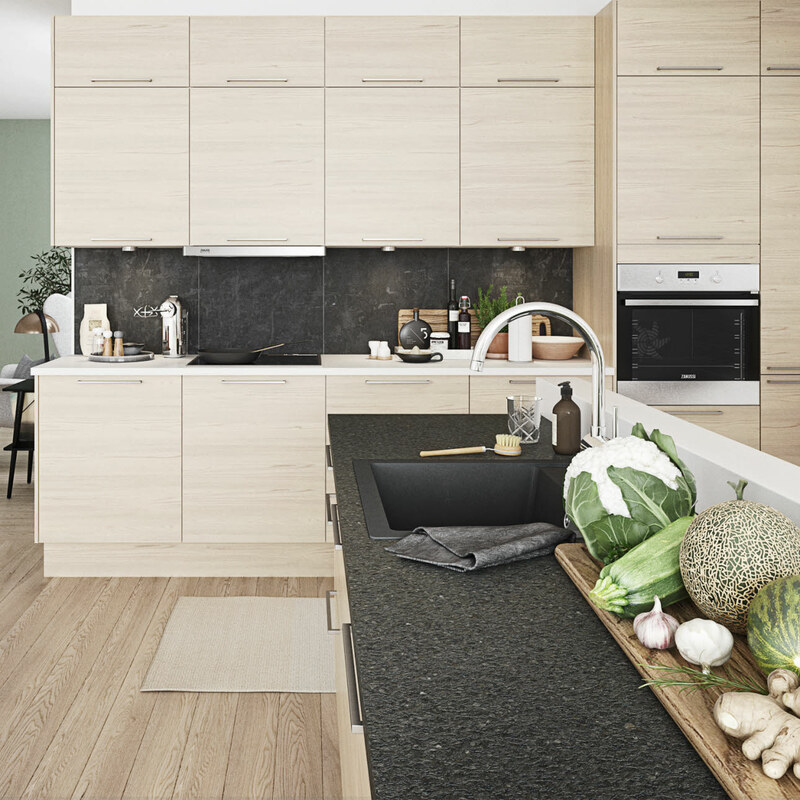 Oslo is also a melamine door, which offers several benefits: No maintenance, easy cleaning and an appealing price. 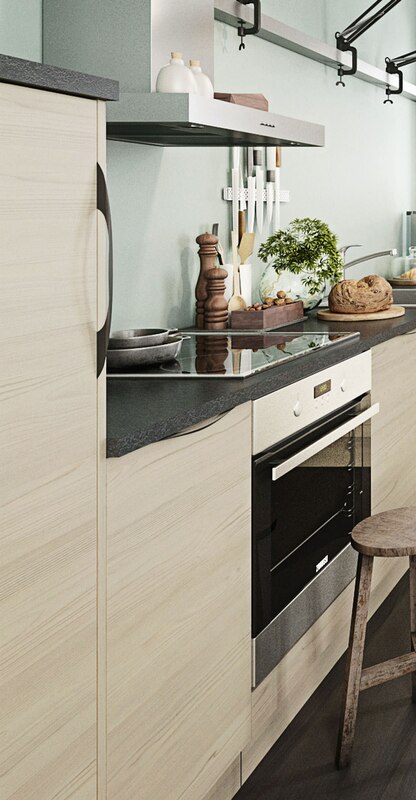 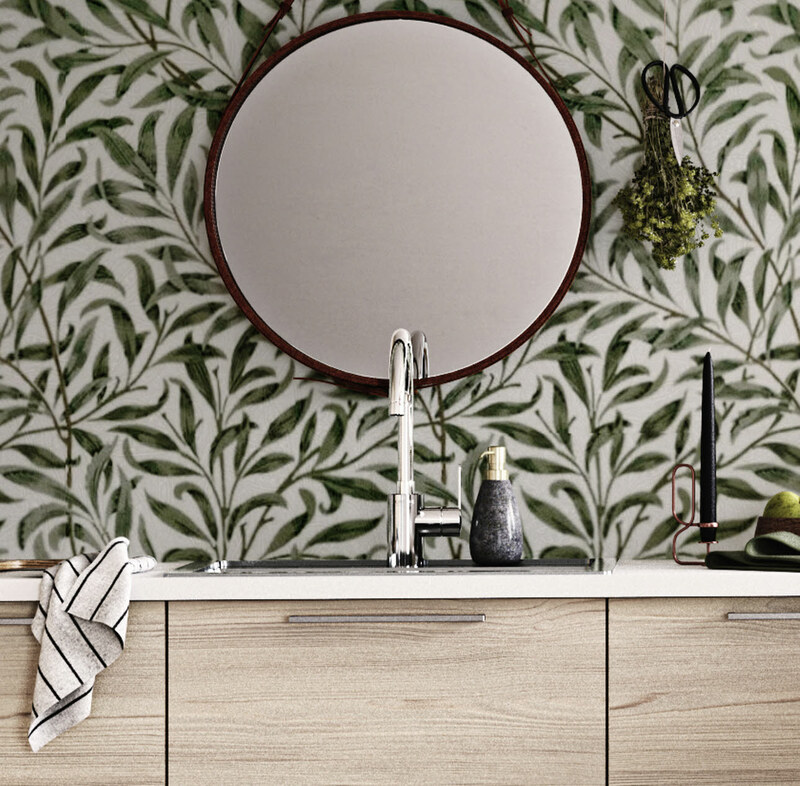 Oslo has a surface structure with natural horizontal veins, adding a warm wood look to your Scandinavian kitchen. 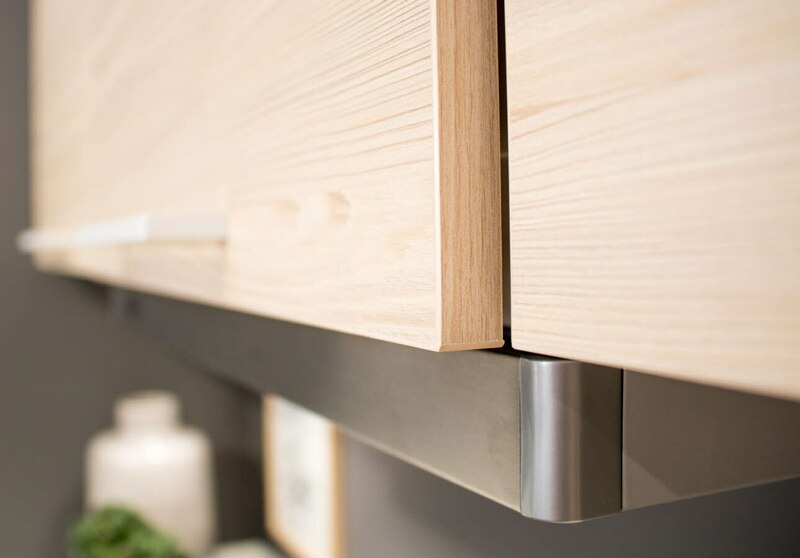 You can accentuate the style using several of our handles. 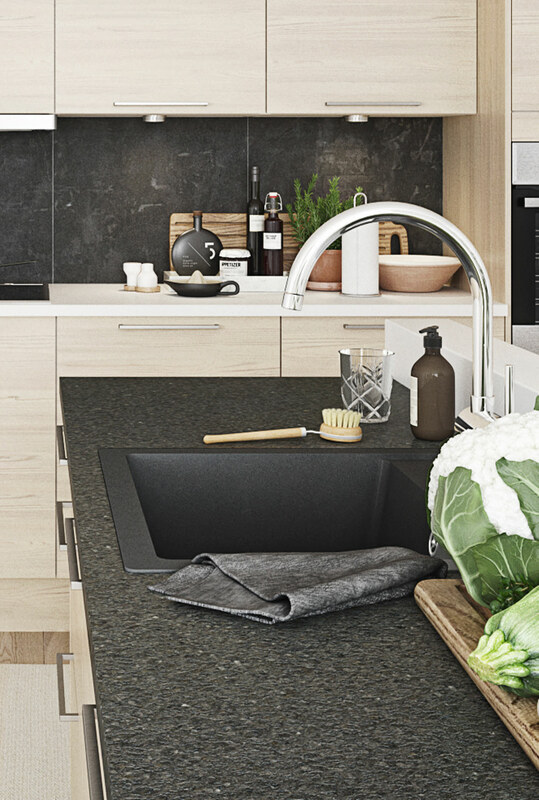 Choose either a light or dark worktop, as both look great with a wood look kitchen. 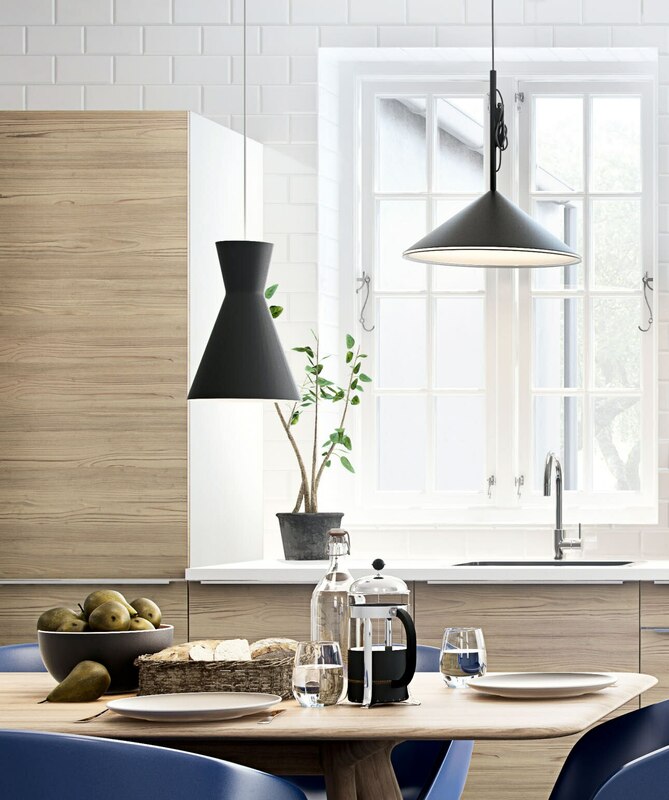 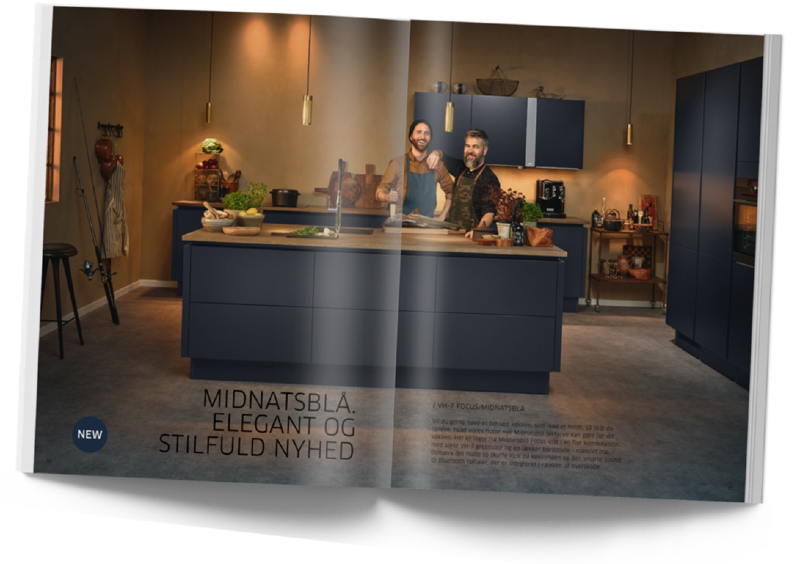 Model Oslo is a Scandinavian kitchen in which the sturdy 16 mm kitchen doors are coated with wear-resistant and easy-to-clean melamine. 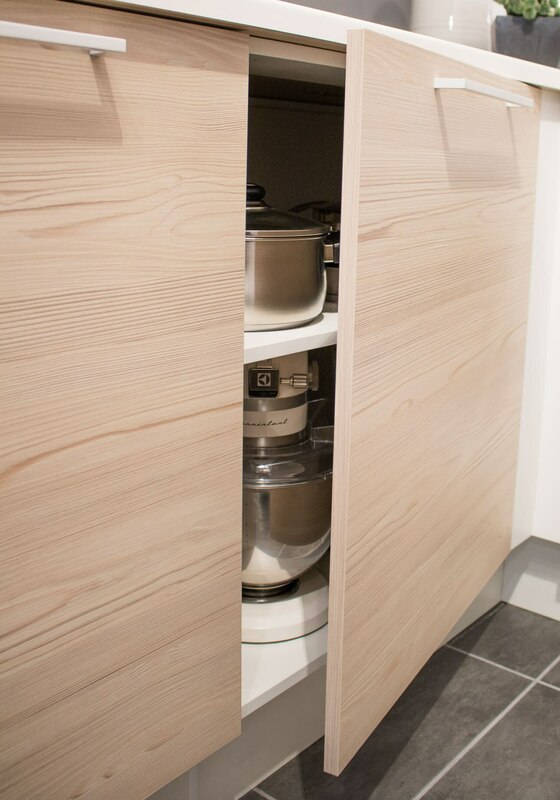 To complete the design, door edges are covered with plastic with the same wood look as the rest of the door. 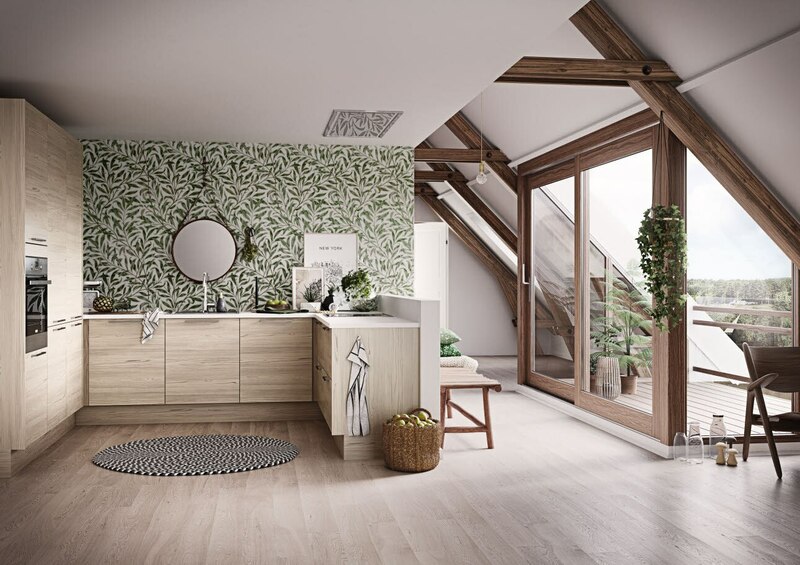 Model Oslo is a decorative door with a structured melamine surface that is wear-resistant and easy to keep clean. 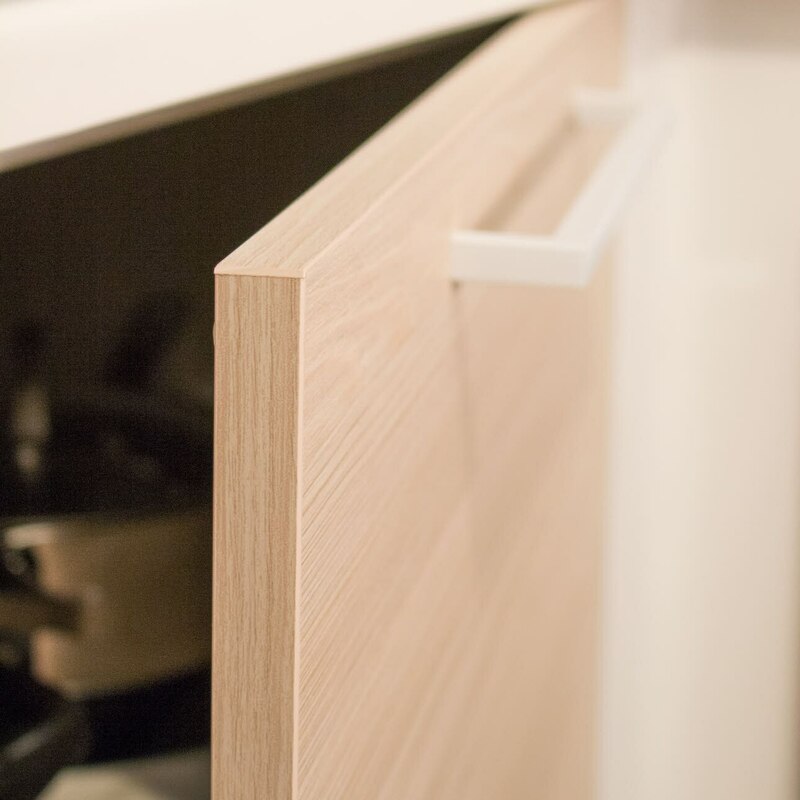 Melamine consists of compressed paper and glue, which is attached to chipboard and then edged with strong plastic strips. 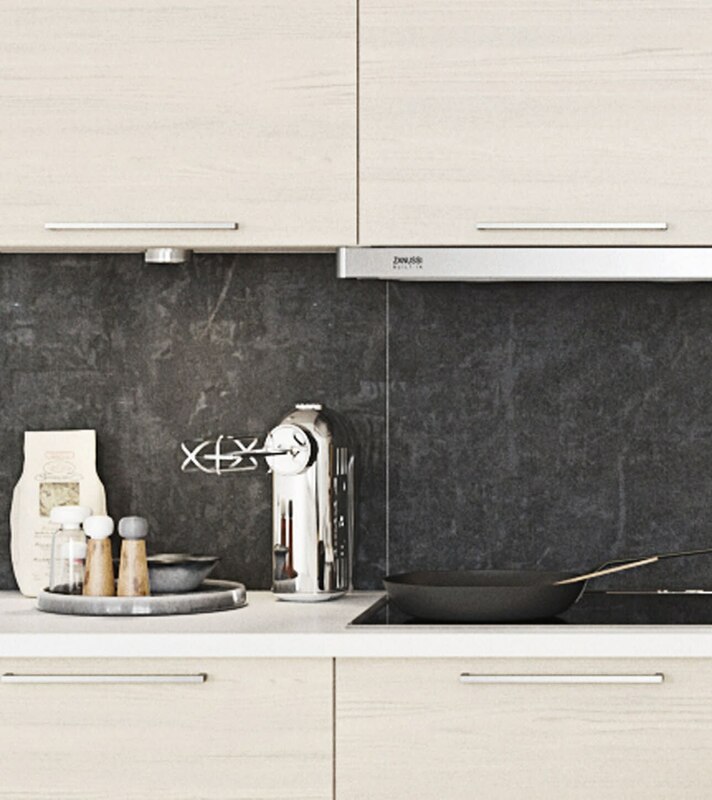 The result is a sturdy decorative door that easily withstands everyday kitchen use. 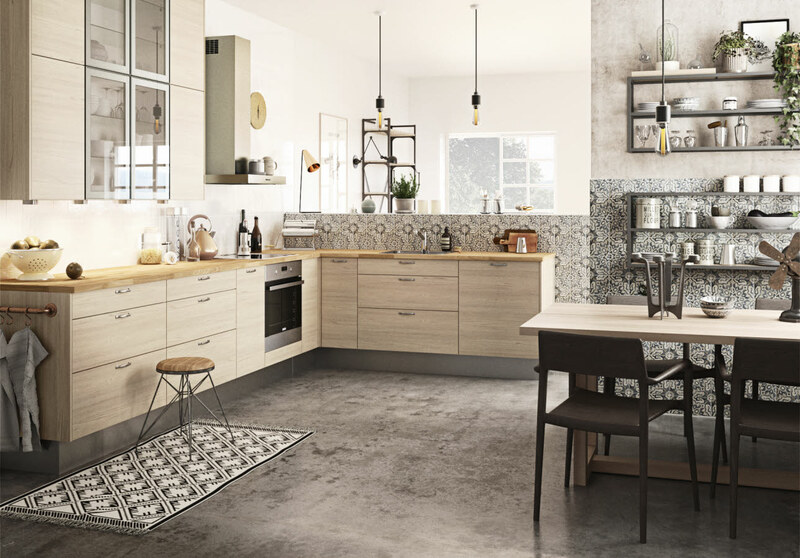 When choosing which model to design your new kitchen using, it is a great idea to visit an HTH store. 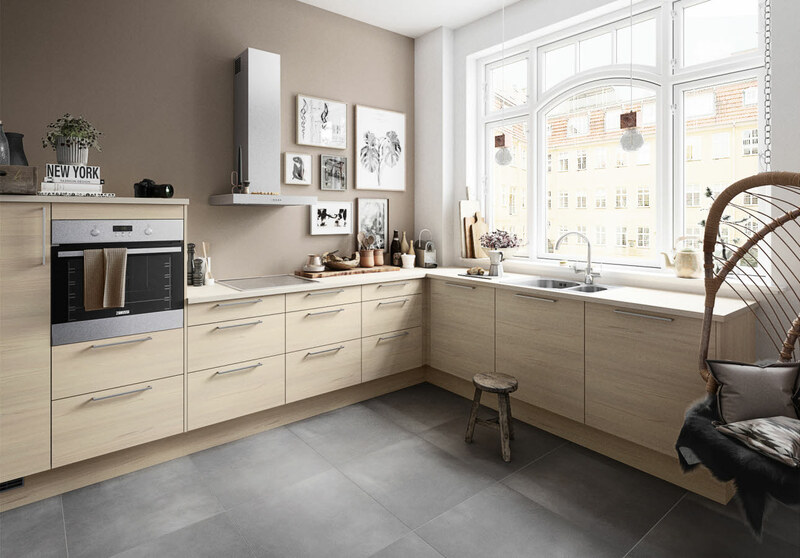 You can see and touch your new kitchen here before making your choice, and get professional advice. 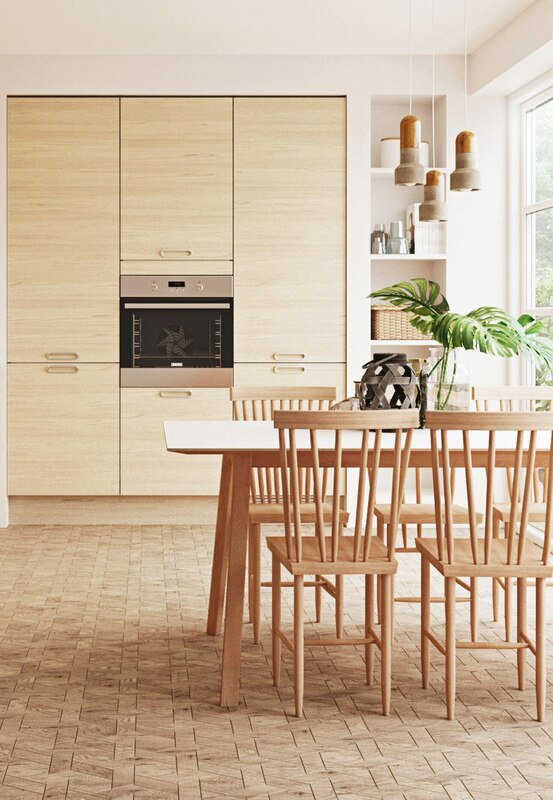 Then you can be confident that your new kitchen will meet all your requirements. 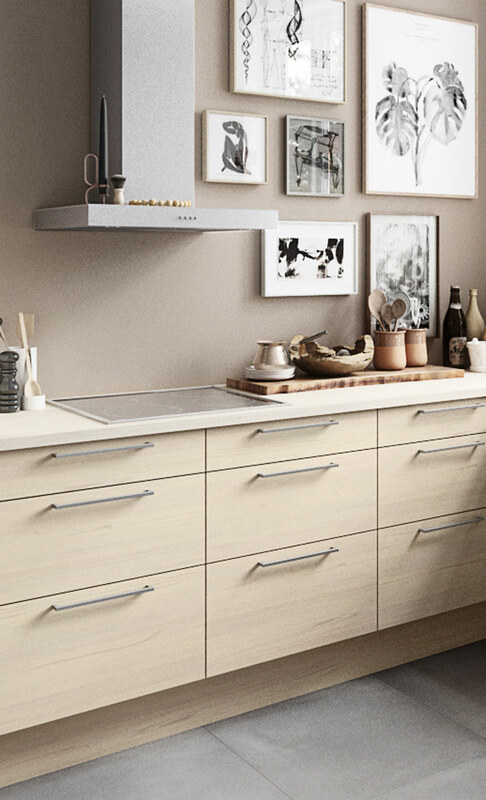 If you want your kitchen to function perfectly, thought-out drawer organisation is an important element. 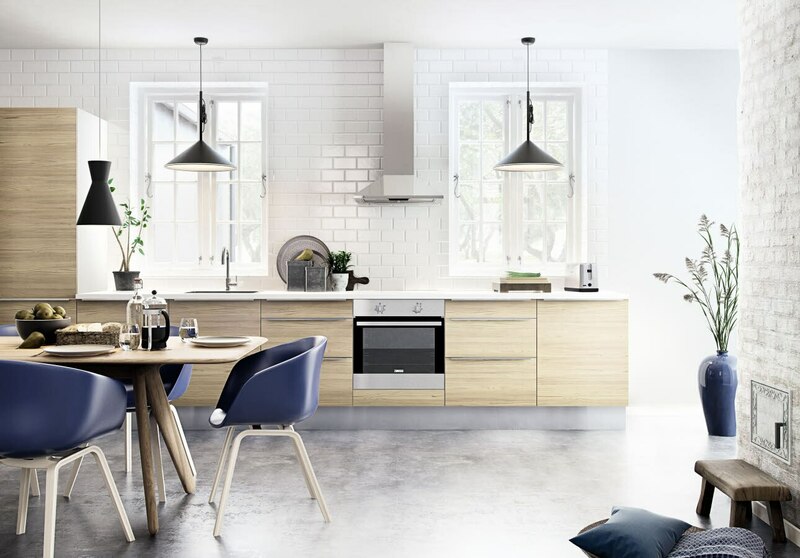 HTH has developed a wide range of attractive and functional organisation solutions to keep everything tidy and easy to find. 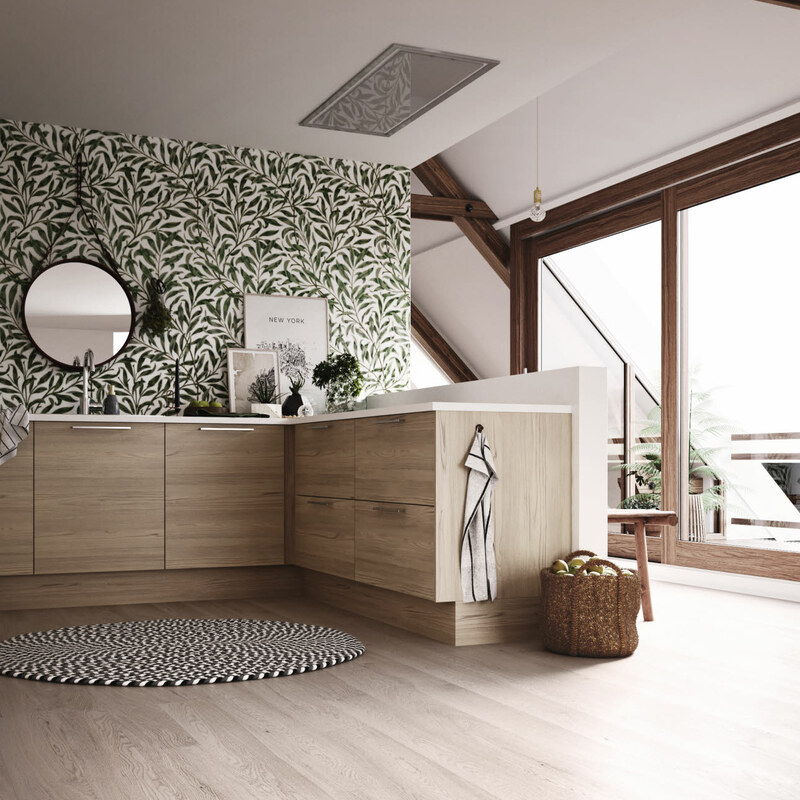 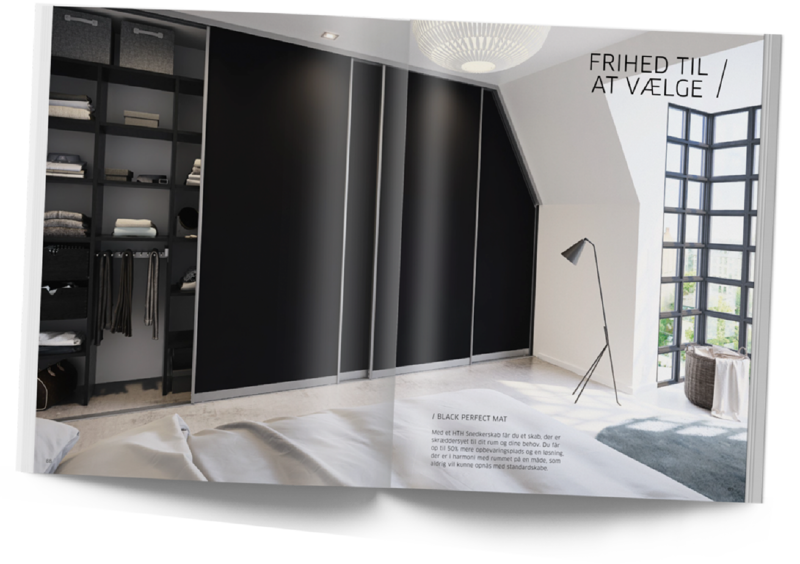 There are countless options for how to organise your drawers and units, to meet your exact requirements. 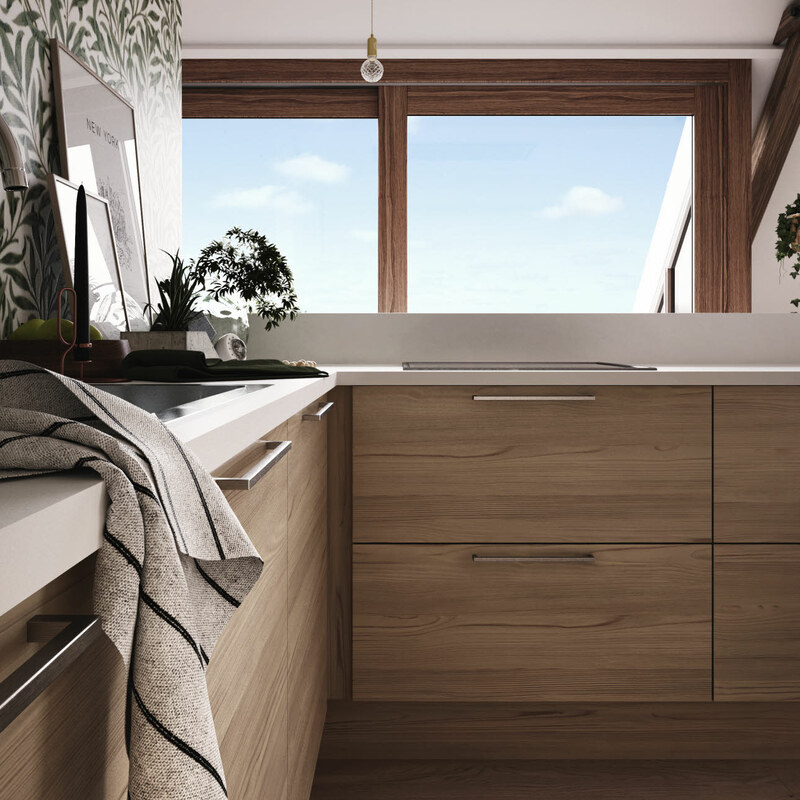 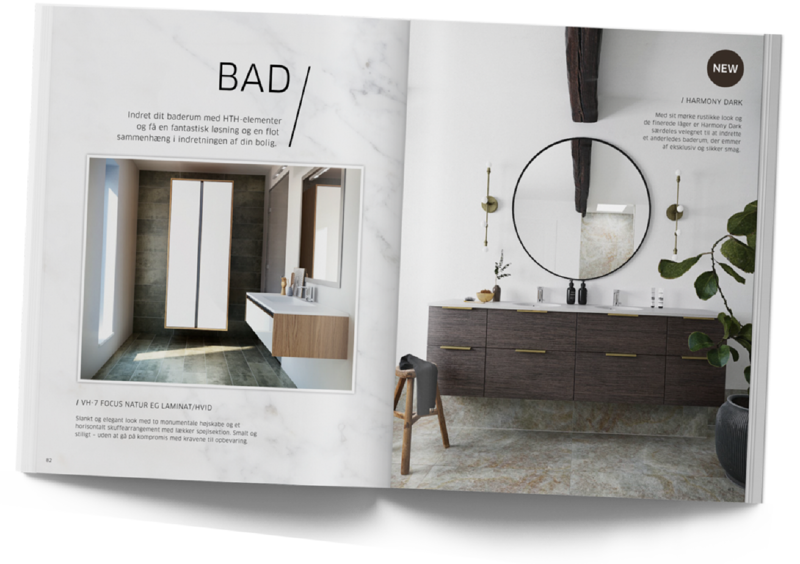 Multifunctional cutlery inserts, dividers, inner trays, plinth drawers and much more are all part of HTH’s range, making it a pleasure to design the interior layout of your new dream kitchen. 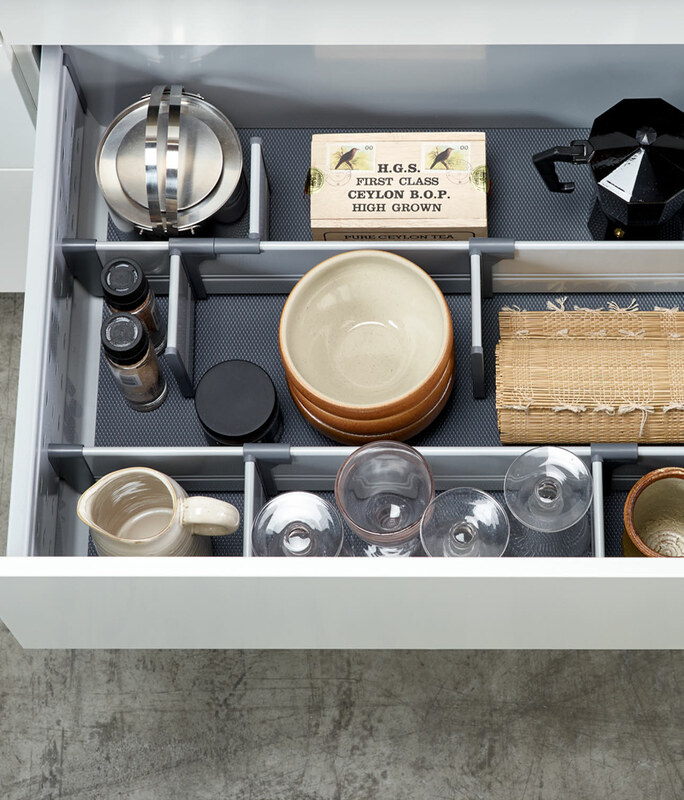 Find inspiration for tidy drawers. 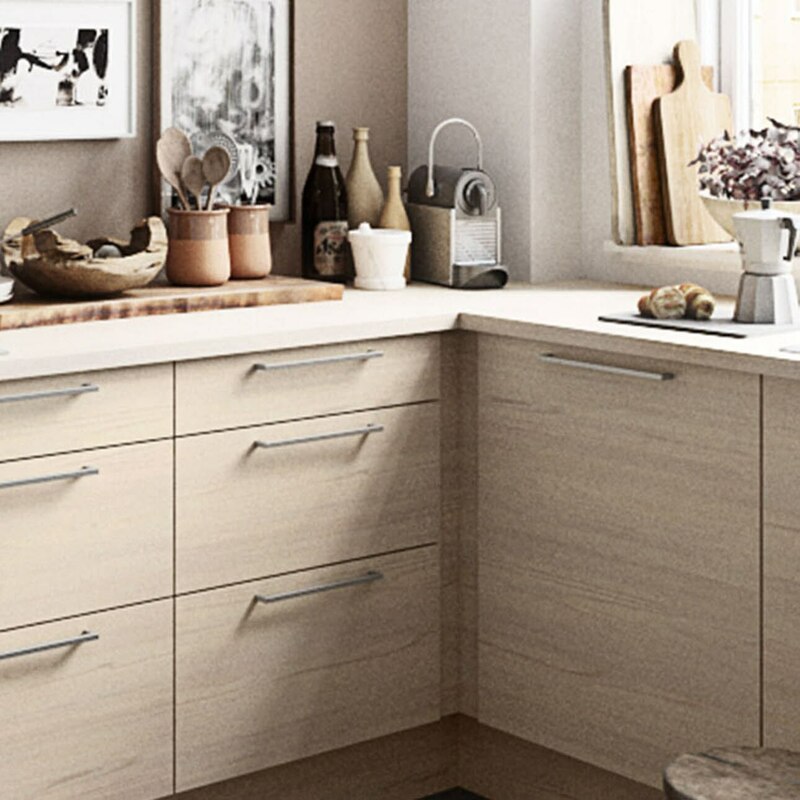 Good advice is very welcome when deciding how to organise your new kitchen. 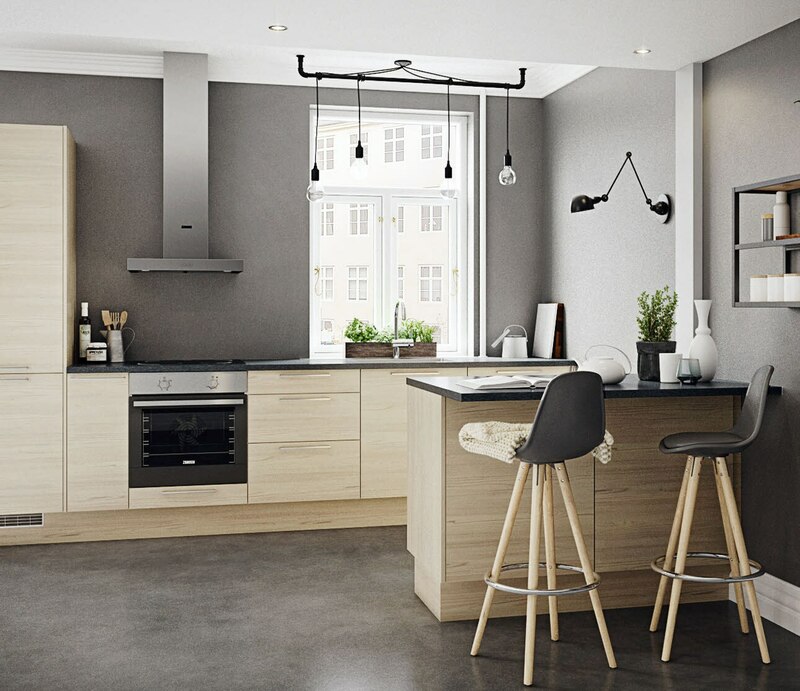 That is why our expert kitchen consultants are always ready to advise you, to ensure you get the best interior layout solution. 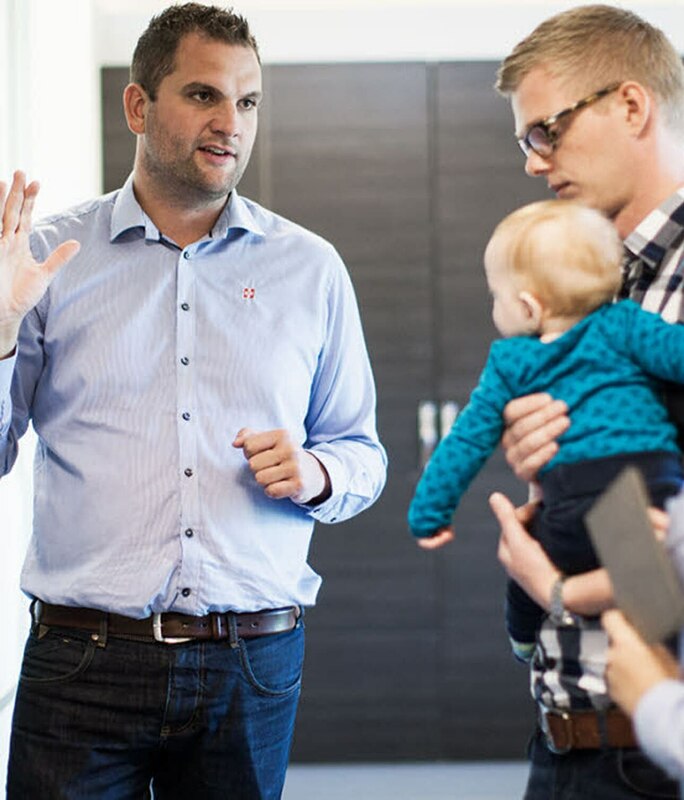 If you want to avoid waiting in the store, you can book an obligation-free design meeting at no charge, where we can review your requirements.